Michael Finkel was a writer for the New York Times magazine until he submitted a story about a main character he'd assembled from a composite of people (and did not tell the magazine that that's what he was doing). He was found out and then lost his job with the magazine. Christian Longo was a guy with a wife and three kids; they were devout Jehovah's Witnesses. When he faced financial problems, Longo engaged in a series of crimes (check counterfeiting, theft) that made his life more and more complicated and unhappy--and he ended up murdering his wife and children. 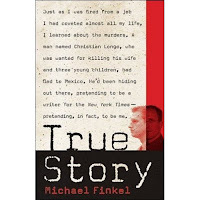 Following the murders, he went on the lam to Cancun, Mexico, where he decided to impersonate Michael Finkel. (He didn't know Finkel had lost his job; he was pretending to be a reporter/writer.) When Finkel, newly fired, found out about the story, he decided to write about it and to get to know Longo. Of course both men still end up lying--as do we all (in varying degrees). This is because life is complex; because truth can be complex (often, contradictory emotional truths can exist, each with validity); and because the act of narrating/writing is always on some level going to be kind of a lie (when you put something into narrative, you retell it and reframe it; you exclude things that do not fit, etc.etc. ; in so doing, you have altered it; narrative theory graduate school etc. blah). Another thing to consider is that human relationships might not always benefit from statements of unvarnished truth. Anyway, the institutions Longo and Finkel are embroiled in--the profession of journalism; religion in the form of the Jehovah's Witness church; the legal system/courts--all devote themselves to establishing absolute truth for the record, whether spiritual or public (and then delivering final judgments such as guilty or innocent; headed to heaven or headed to hell). True Story reveals that these institutions (and the enterprise of storytelling/writing in toto) cannot completely or accurately comprehend the complexity of the situations that the people they are judging must face. Longo and Finkel have already been judged in public and received a label: "disgraced" journalist; murderer. The reality of their stories as Finkel presents it in his book is more complicated, less understandable. 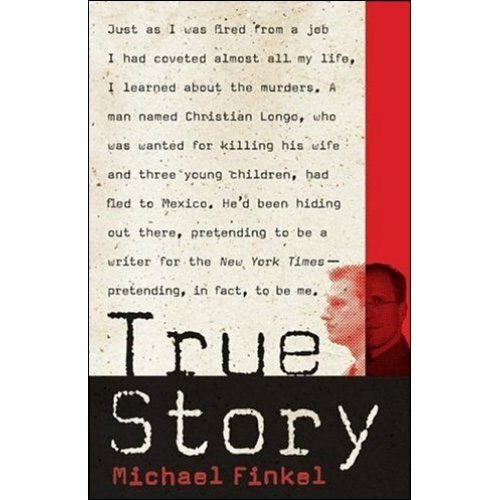 Moreover, as the book progresses, it becomes even less reliable: throughout the narrative, Finkel obsesses about Longo's tendency to lie, and is warned by many others about being "taken in"; and Finkel himself ends up lying to Longo (though he does confess). We just don't know what the final truth is, absolutely. To make sense of the world, in all our judgements and acts of writing, we must siphon selected items from the overwhelming, unknowable field of reality. Always, something is left out. Always, something is canceled out or repudiated--even though its opposite might also hold true. Sometimes we leave things out because of self-interest or greed, but sometimes it's because of fear or genuine lack of comprehension/scope of vision. Sometime we think we're telling a better version of something even if it isn't strictly true. There's no way, ever, to tell it all. In the end, then, this book must of course frustrate, since what it shows us is that the truth of any story, any crime, is ultimately too complex to be sewn up neatly, even though in our courts and moral/ethical decisions we must, nonetheless, make judgments about what we can establish to be true. It's a losing battle, I guess, one that always leaves one feeling unsettled and unfinished. However, on the "upside" (that is one revolting word, no? ), that lack of fulfilment is precisely what produces language, narrative, and art, so we must also be glad for it--or at least able to admit to ourselves that it exists, even if it does not bring happy or simple narrative closure. Weaknesses: Finkel could've done more with his own crime here. He "murdered," or at least erased, a real person in his false story; wanted to hear more about his response to that. Also, he tells us that on the day he sees the pix of the Longo's dead family (in Longo's trial), that is the end of their friendship--but he continues to engage with Longo and I'd liked to have seen more reflection on this point. I'm fighting the urge to explain too much but talking about why I didn't finish these makes me feel mean. I hope that you understand that just because I didn't like these doesn't mean you won't. And feel free to let me know how wrong you think I am. The Little Book by Selden Edwards*. I picked it up last week, read a while and it just isn't for me. It didn't grab me or particularly interest me and there are too many other books that I know I want to read. It's also possible that the ridiculously gushy blurbs had an adverse affect (that happens to me sometimes). Little Women by Louisa May Alcott. I know, I know. This probably makes me a bad person but I completely lost interest after whatsername died. Shades of Grey: The Road to High Saffron (Shades of Grey, #1) by Jasper Fforde. I'm still kind of mad about this one. I love Jasper Fforde. I wish he'd keep writing books about books. Oh my god so boring. Speculation about the future, no matter how well-supported, is almost never something I want to read about. Note to self: stick to science books by Mary Roach or on a creepy topic (preferably both!). The Wordy Shipmates by Sarah Vowel. This one is just temporarily abandoned. I honestly think I'll get back to it, I just need to be in the right mood. *This was an unsolicited free advance copy from the publisher. I received it as part of a program where publishers send advances to staff at other publishing houses.